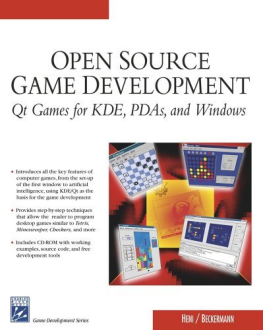 This webpages is the online update and correction center for the Open Source Game Development: Qt(R) Games for KDE, PDAs and Windows book from Charles River Media. If you found errors, corrections or updates to any of the book contents, examples or tools please send an email to us. Trolltech, Qt, Qtopia and their respective logos are registered trademarks of Trolltech AS in Norway and other countries worldwide. We would be happy to learn about more reviews sites if you find them somewhere on the intertnet. This section contains corrections to the printed version of the book. This section contains updates for the CD-ROM programs.